The Other World combines a thematic and area studies approach to explore contemporary global issues in the developing world. Accessible and interdisciplinary, this text offers political, economic, social, and historical analysis plus case studies on Latin America, Sub-Saharan Africa, Asia and Eurasia, and the Middle East and North Africa. Highlighting similarities and differences among these regions and focusing on enduring problems, The Other World is a practical look at the issues affecting the majority of the world's population. Shift of focus from colonialism toward globalization, with continued attention to the legacy of colonialism. Re-cast connections between conceptual chapters (politics, economics, and culture) and regional chapters, allowing students and professors to make comparisons and contrasts more readily. Joeseph N. Weatherby was Professor of Political Science at California Polytechnic State University, San Luis Obispo. Craig Arceneaux is Professor of Political Science at California Polytechnic State University, San Luis Obispo. Anika Leithner is Professor of Political Science at California Polytechnic State University, San Luis Obispo. Ira Reed was Professor Emeritus at Trinity Washington University. Benjamin F. Timms is Associate Professor of Geography at California Polytechnic State University, San Luis Obispo. Shanruo Ning Zhang is Associate Professor of Political Science at California Polytechnic State University, San Luis Obispo. The Other World is a valuable teaching tool during this era of rapid and far-reaching change both in America’s role in the world and in the debate over globalization. The new edition of this book clearly and vividly depicts the governmental systems, and the debate over globalization that is taking place within them, as countries the world over attempt to modernize their economies and as societies confront increasingly challenging environmental, technological, economic, and strategic transformations. Buckle up, readers, we are in for a bumpy ride! This new edition of The Other World provides an invaluable and timely "big picture" account of how the forces of globalization have shaped development. Written in highly accessible prose, this book will shift its readers’ perspective on concepts like developed and underdeveloped, globalized and national, North and South. Students of globalization and development, take note! 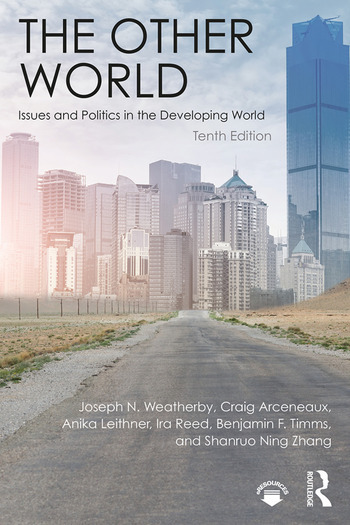 The tenth edition of The Other World: Issues and Politics in the Developing World is the perfect introductory text to the world’s developing regions and their political challenges. The early chapters expertly lay out the necessary broad theoretical underpinnings, and the case-study chapters allow for more detailed exploration of each of the developing regions. What I particularly like about this new edition is that it is up to date on the political problems that we currently see in the news, which facilitates classroom discussion, engagement, and instruction.